Organization is so important when it comes to traveling. I wanted to share the pros and cons of using both compression bags and packing cubes to help you decide which one to use for your upcoming trip! 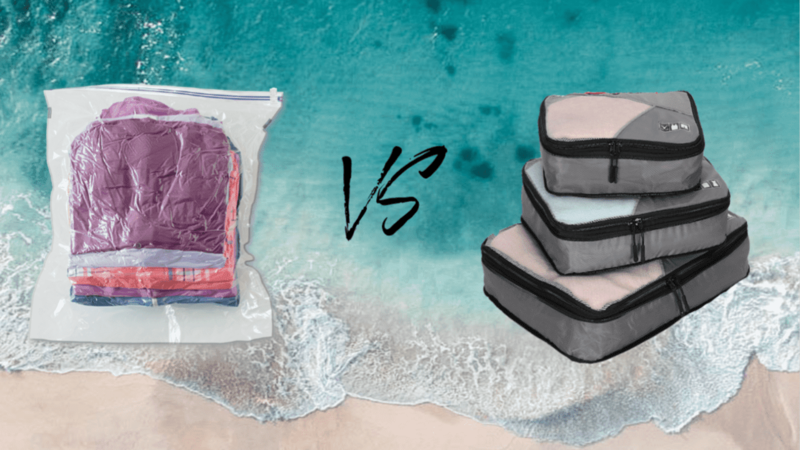 Compression Bags vs Packing Cubes. I've love using both packing cubes and compression bags to organize my things when traveling but I use them for different reasons and depending on the trip that I'm going on. I find that both of these products work great but you should keep a few things in mind to pack efficiently and use up your luggage space wisely! Compression bags or also known as space bags, are a newer way to pack your things when going on vacation. It essentially takes out all the air within the bag to make it more compact when packing it into your luggage. There are two forms of compression bags, one has a vacuum seal and the other one does not. The one the doesn't have a vacuum seal require you to squeeze the air out the bag manually. You're able to purchase these on Amazon (click here) or you can buy them in store at your local Bed Bath and Beyond. Compression bags come in many sizes so make sure you get a variety pack to have different options when using them. I started using compression bags for my travels last year, when I was traveling to Russia for the FIFA World Cup. I was gone for one month and could only bring a carry on suitcase with me. We were traveling to different cities within Russia which had different climates. I wasn't sure what to pack but I was able to bring light jackets, sweaters, and dresses all because of these compression bags that helped me fit everything into my carry-on suitcase. Compression bags are such a game changer for me when it comes to the organization within suitcase while traveling. As a person who tends to over pack and like to have many options, these compression bags make it able to pack more and still have space in my suitcase for other things. While this is a great option, there are some cons to consider when using compression bags. If you're using a vacuum sealed compression bag, you have to keep in mind the accommodation that you will be staying in. If you don't have a vacuum available, you won't be able to get the air out and repack your stuff. The bag won't get as flat and compact as it once was before departing for your trip. If you're using a regular compression bag, this won't be an issue. Another con is that your clothes may be creased or wrinkled when unpack your things. If there is an iron at your accommodation this won't be an issue but if your accommodation doesn't provide one you should keep this mind. A way to get those wrinkles and creases out is to pack a wrinkle release spray or bring your own clothing steamer to avoid these issues. One of my first posts onto my blog was about packing cubes, so if you wan to have a full review on them (click here). But to just summarize that post, Packing cubes are bags that organize your things in your luggage. They come in many different sizes, colors, and styles. You can find packing cubes literally anywhere nowadays but if you're an online shopper, Amazon (click here) is a great place to order them. If you're a in-store shopper you can find them at your local TJ Maxx or Marshalls in their travel section or visit your local travel store. They usually come in sets but you can also buy them individually and they are very affordable! I've been using these for so many years now and have collected a few over time and I find them to be great, just knowing where everything is while traveling and everything has it's own dedicated cube. As much as I love packing cubes they can be bulky if you are stuffing them with a lot of things or if you're using a lot of packing cubes in your luggage. I don't find them to be useful if you are traveling for a long period of time with a carry-on suitcase or backpacking. They do take up a lot of space and you may not be able to fit other things if you are using too many packing cubes or stuffing them to their limits. But if you're using a checked-in larger suitcase, you have more space to add more packing cubes. If you're doing more of a shorter term trip (weekend or week long trips), packing cubes are great for any sized luggage. Another factor that comes into play is the location that you will be traveling to. A tropical destination usually means packing lighter clothes which doesn't take up much space or weigh as much. If you're traveling to a more winter-esque destination which requires bulkier clothing and usually winter clothing is a bit heavier. I find that packing cubes aren't the best for those winter-esque trips because on how bulky it can get. Another way to utilize packing cubes is by using them to store electronic cords and changers if you do travel with those things abroad. Instead of throwing them into your bag putting them in a packing cube also helps organize other things besides clothing when traveling. As I mentioned, both products are amazing and do their jobs when it comes to organization during traveling. I continue to use both products for my travels and always recommend both products to anyone who asks me about packing organization. It all comes down to the type of packer you are, the destination you're traveling to, how long your trip is, and of course the type of luggage you will be using. Hope this was informative and helpful to those who are interested in these products and trying to decide what to use on your upcoming trip! Which one do your prefer. compression bag or packing cubes? Interesting read! 💕 thanks for sharing the knowledge!! I've used compression bags for storage at home but never for travel. I'll definitely consider using them on my next trip. I do love my packing cubes. Yes you totally have to, keeps everything so organized! Im heading to HongKong next month and this read couldnt come at the best time. I hope come they up with manually vaccumed comoression bags someday. Personally, I'm a compression bag girl! I can get so much more when packing with these. The only thing I use a packing cube for is for whatever jacket I'm taking with me on the plane. It keeps my backpack more organized and can double as pillow if I need one. haha thats genius to make it double up as a pillow! I'm a big fan of packing cubes! I use them even for a weekend away. I've never tried compression bags though. Sounds like I should! This is a good tip for traveling. I've never heard of compression bags though, but would surely love to try. Is this a new concept? It's new-er concept as opposed to packing cubes! Very interesting as I have just been considering purchasing some packing cubes. I didn´t even that instead, I could consider the bags. This definitely pushed me to do a purchase and not just think about it as I have for such a long time now. Thanks for the inspiration!